We’ve been operating under the premise of only accepting cash and checks. Lately, this has become an issue for us and out customers and clients. We set out to find a solution to make everyone happy, and we’ve done it! Many of our customers and clients don’t want to use PayPal as they think you need a PayPal account to use PayPal. This is not the case, but nevertheless, we’re all about efficiency and making things easier for our customers and clients. PayPal charges a hefty fee for each transaction. We don’t like to pass this fee on to the customer, but for the sake of convenience, we end up loosing profits. New browsers are releasing this month. Are you running an old version or are you a brave one still using the beta? Either way, make sure you update to the latest Release Client version of your browser of choice. Microsoft has decided to release it’s latest browser: IE9. A little behind the times, Microsoft finally has a shot to win back some of it’s users that migrated to Firefox or Chrome. This will be a tough pitch to sell, as IE9 is not compatible with Windows XP. This means that roughly 55% of the world’s computers will not be upgrading to the new browser. IE9 will be more compliant to web standards and offer many HTML5 features not seen in IE7 or IE8. There”s is also a change in the user interface to be more “user-friendly”. One box — means your address bar is now a search bar. New pages open in a new tab rather than a new window. Focused on your websites — means there is no jumble of icons at the top of your browser. It is streamlined to deliver your content with littler interference. Short on the heels of Microsoft’s release in the launch of Firefox 4 next week. 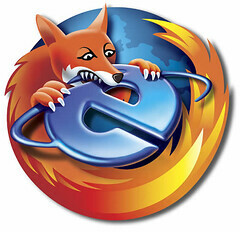 In the new release, Firefox has a dramatic overhaul with the user interface and it will follow web standards much more. They have a full series of new and improved features on their site: http://www.mozilla.com/en-US/firefox/features/. Both of these browsers take on the new look that Google Chrome has been using for the past couple of years. And utilizing the address bar as a search field. All I have to say is It’s about time!. As Charles Caleb Colton once said, “Imitation is the sincerest of flattery.” And we’re seeing that now with the browser wars. Currently NWTD recommends Google Chrome as your primary browser. Not only is it faster than most other browsers, it’s also more secure. No matter what browser you use, do yourself a huge favor and upgrade to the latest version. Not only will you be more secure from the nasty malware on the internet, but your browsing speed will increase. Thunderbird is by far, the most dynamic mail client that is free and open source. There are a variety of add-ons, that expand the capabilities further than any of the other mail clients. Mozilla, the folks that brought us FireFox, are the crafty designers of this functional tool we know and love today as Thunderbird.